Katharina Suske was born in Graz Austria. 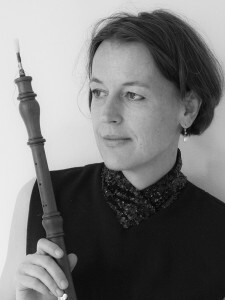 Katharina M. Suske studied the recorder at the Graz Musikhochschule. She finished her studies in 1985 with the concert diploma, with honour. Afterwards, repertoire-studies with Pedro Memmelsdorff at the Scuola Civica in Milan. Katharina M. Suske then pursued baroque oboe studies at the Musikhochschule in Vienna with Hans Peter Westermann and at the Royal Conservatory Den Haag with Ku Ebbinge. Katharina M. Suske participated in Various renowned ensembles for Early Music, amongst others: Akademie für Alte Musik, Berlin Drottningholms Baroque ensemble and Drottningholmsteaterns Orkester (cond. A. Östman) Wiener Akademie (cond. M. Haselböck) Les talens lyriques Münchner Hofkapelle the Zurich Opera baroque orchestra La Scintilla (cond. W. Christie, A. Fischer, N. Harnoncourt). I barocchisti (cond. D. Fasolis) Concilium musicum Wien (cond. P. Angerer) London baroque Ensemble 415 (Ch. Banchini). Katharina M. Suske is founder of the Berne Ensemble Die Freitagsakademie (www.freitagsakademie.ch), and founder of the Friday evening concert series in the Bern Art Museum Freitagskonzerte im Kunstmuseum Bern. Katharina M. Suske won a half-year residence in New York in 2002 on a scholarship in the artist studio owned by the Canton Bern. Recording as soloist: 2000: J. G. Janitsch: Chamber Music / Die Freitagsakademie (Coproduction Swiss broadcasting corporation DRS2/ Sonimex) 2001: J. S. Bach: Concertos / Die Freitagsakademie (ORF EDITION ALTE MUSIK) 2004: J. S. Bach: Wedding cantatas / Die Freitagsakademie, with Susanne Rydén, soprano (ORF EDITION ALTE MUSIK) 2008: Bach/Suffi (Cantatas by Bach combined with Suffi-Music/ cond. H. Griffiths) 2009: Travelogues of Italy / Die Freitagsakademie (winter and winter).